SOIL erosion worldwide is threatening agriculture. 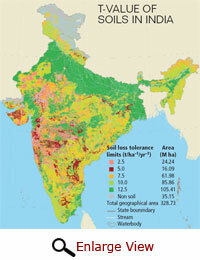 A group of scientists has calculated that about 7.5 per cent of the soil in India is extremely vulnerable to erosion. Scientists at the Central Soil and Water Conservation Research and Training Institute in Dehradun employed a concept to evaluate susceptibility of soil types to erosion across India. Called T-value, the concept refers to the maximum amount of loss a soil can tolerate per hectare per year without affecting crop productivity. If a soil type is eroded beyond its T-value, it will hamper crop cultivation. A default T-value of 4.5 to 11.2 megagrammes per hectare per year (Mg ha–1 yr–1) is assumed for most soils in India. Although all types of soil have the ability to withstand a certain amount of erosion, it is unavoidable, argued researchers in the study published in the February issue of Current Science. 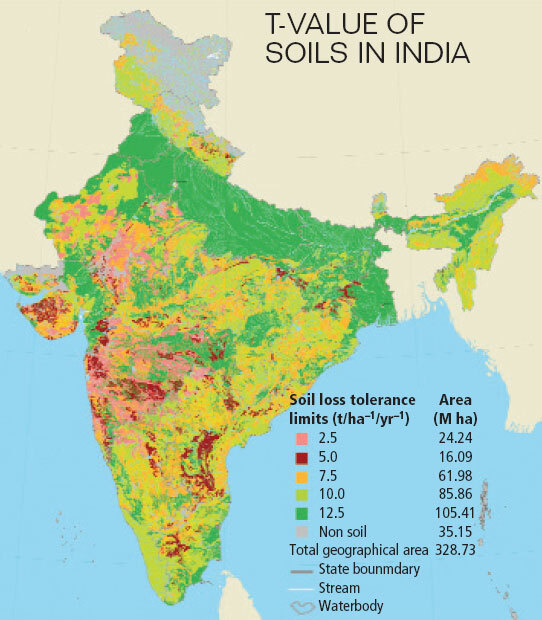 “Till date no standard method existed to calculate soil loss tolerance, especially in the Indian context,” said lead researcher Debashis Mandal. The current method will help adopt measures that can bring erosion down to permissible limits, he added. Soil erosion is known to exacerbate desertification. The research team studied a total of 1,649 soil mapping units representing various physiographic regions of India, like coastal plains, mountains and the peninsular plateau. The soils were classified into three categories on the basis of five factors, namely infiltration rate or the soil’s ability to absorb and channel water, bulk density, soil erodibility, organic carbon, and pH, a measure of soil’s acidity. Each factor was graded on a scale of zero to one, with zero representing the lowest value on the basis resistance to erosion. Further, different “weights” were assigned to the factors based on their importance in resisting erosion. Infiltration rate was given the maximum weight and bulk density the least. Based on this calculation, the soils were grouped into three categories depending on their resistance. The T-values of the soils were obtained by cross referencing values of the three groups against the depth of the soils in question. The researchers found that about 57 per cent of the area in India has T-value less than 10.0 Mg ha–1 yr–1, and 7.5 per cent area has a T-value of 2.5 Mg ha–1 yr–1 (see box). Black soil found in regions of Maharashtra and Gujarat is most at risk of erosion as the areas witness intense and erratic rainfall. “The content of organic carbon is also very low, thus ability to resist erosion is poor. These soils contain high amounts of clay particles, which are eroded most easily,” Mandal added. Researchers cross-checked these results with the time-tested productive-index approach, which measures crop productivity of a soil. The results were in compliance. A 2010 study by the same institute had revealed India loses 5,334 million tonnes of top soil annually due to soil erosion.